We ought to seek to gather in this world — treasure that we can carry with us through death’s gates, and into the eternal world. We should strive to build into our lives — qualities that shall endure… Yet there are things — virtues, fruits of character, graces — which men do carry with them out of this world. What a man IS — he carries with him into the eternal world. Money and rank and pleasures and earthly gains — he leaves behind him; but his character, he takes with him into eternity! This suggests at once, the importance of character and character-building. Character is not what a man professes to be — but what he really IS, as God sees him. Christ’s character is the model, the ideal, for every Christian life. We are to be altogether like Him; therefore all of life’s aiming and striving should be towards Christ’s blessed beauty. His image we find in the Gospels. We can look at it every day. We can study it in its details, as we follow our Lord in His life among men, in all the variations of experience through which He passed. We cannot merely dream ourselves into godly manhood or womanhood; we must forge for ourselves, with sweat and anguish, the beautiful visions of Christ-likeness which we find on the Gospel pages! It will cost us self-discipline, oftentimes anguish, as we must deny ourselves, and cut off the things we love. Character is a process of growth. It is like fruit—it requires time to ripen. Different kinds of fruits come to ripeness at different seasons; some in the early summer, some later, and some only in the autumn. It is so with Christian lives—they ripen at different seasons. There are those who seem to grow into sweetness in early years, then those who reach their best in the mid years, and many who only in the autumn of old age come into mellow ripeness. All of life is a season of character-growing! We are left in this world, not so much for what we may do here, for the things we may make—as that we ourselves may grow into the beauty of mature Christian character. In the midst of all our occupations and struggles, all our doing of tasks, all our longings and desires, all our experiences of every kind—there is a work going on in us—which is quite as important as anything we are doing with our mind or with our hands. The object of life—is to learn to live. We are at school here, and shall always be at school, until we are dismissed from earth’s classes to be promoted into heaven! It is a pity if we do not learn our lessons. It is a pity if we grow no gentler, no kindlier, no more thoughtful, no more unselfish, no sweeter in spirit, no less worldly, if the peace of our heart is not deepened—as the years pass over us. Old age should be the true harvest time of the years. Life should grow more and more beautiful, unto the end. It should increase in knowledge, in wisdom, in all the graces of the Spirit, in all the sweetness of love, in all that is Christlike. Aged Christian people, should be like trees in the autumn, their branches full of ripe fruit to feed the hunger of those who live about them. We have but one life to live; we pass through this world but once. We should so live—that every step shall be a step onward and upward. We should strive to be victorious over every evil influence. We should seek to gather good and enrichment of character, from every experience, making our progress ever from more to more. Wherever we go—we should try to leave a blessing, something which will sweeten another life or start a new song or an impulse of cheer or helpfulness in another heart. Then our very memory, when we are gone—will be an abiding blessing in the world. *These quotes were taken from J.R. Miller’s articles: The Ripening of Character and What is it for You to Be a Christian? 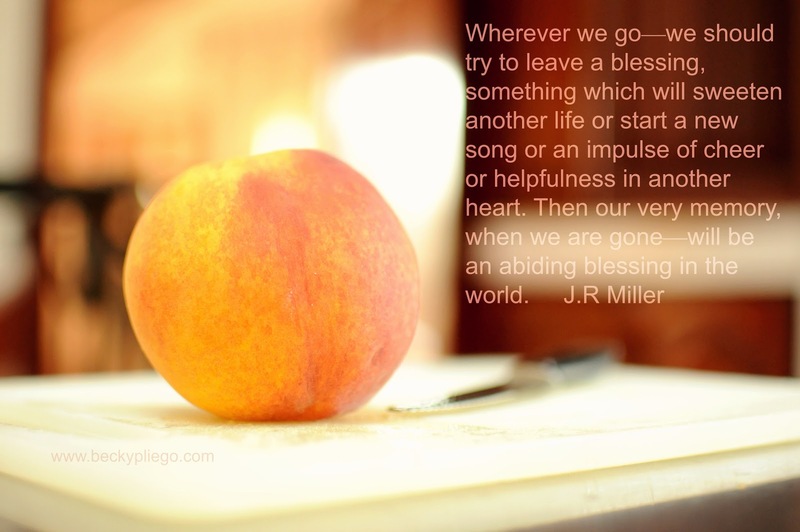 This entry was posted in Borrowed_Words, Daily Life, Living_in_the_Sacred, Miller, Photo Play by Becky Pliego. Bookmark the permalink. Love the footnotes, dear Becky! Just popped them up. Such GOOD words to sink into the soul and chew on. A man may not be as good as his reputation. A good reputation may hide an evil heart and life. .. character is what the man IS. Thanks for coming by! I just included the sources of these quotes as footnotes. I am glad you are finding in this place good words and encouragement in your daily walk. Hope to “see” you here often. I found you a while back via Patricia (Pollywog Creek) and I'm so thankful for your voice of Truth out here in Blogland. I'm reading through the Nancy Leigh DeMoss trilogy “Brokenness” – “Surrender” – “Holiness” and I find commonalities between this post and my recent readings. This is a beautiful, and fearsome post. I'd love the name of the book. I especially liked what was said about old age, can't help but pray it will be true of me.